Politics and crime is an ancient tradition that never dies. Macbeth murdered his way to the throne, King David used political power to send his romantic obstacle into battle, and corrupt governors are still trying to sell public appointments. Whether the crime is committed for political purposes, covered up by political power or made possible by political position, crime and politics go together Our panel has written about bad behavior from small towns to the global stage to the long-ago and far-away. And it all looks familiar. Julia Pomeroy was born in Japan, and grew up in Africa and Italy. She now lives and writes in upstate New York. Her first two mysteries, featuring waitress Abby Silvernale, are The Dark End Of Town, and Cold Moon Home. Her latest, No Safe Ground — a thriller — is coming in 2013, published by Five Star Publishing. Joseph Kanon was educated at Harvard and Trinity College, Cambridge, and was for many years a publishing executive. His first novel, Los Alamos, was bestseller and won the 1997 Edgar Award for Best First Novel. Subsequent books include The Prodigal Spy, The Good German, Alibi, and Stardust. A new novel, Istanbul Passage, will be published this May. He is also the recipient of the Hammett Award from the International Association of Crime Writers and an Anne Frank Foundation Writer’s Award. He has written all his books at the NYPL. H.T. Narea is an investment banker with twenty-plus years of experience, including a tenure as a principal at JT Morgan Chase. He advised governments, banks, and companies around the world on complex financial issues, but he got his start in fiction researching and editing several books by his father- in- law, Paul Erdman, the New York Times bestselling creator of the financial thriller. The Fund is his first novel. His family’s roots are in Chile and Spain’s Basque Country, and he has lived in Brazil, Venezuela, and Thailand. Currently, he lives in Greenwich, Connecticut with his wife and two young daughters. Laura Joh Rowland is the author of the mystery series set in 17th c. Japan that features samurai detective Sano Ichiro. Her work has been published in 13 foreign countries and nominated for the Anthony Award, the Hammett Prize, and the Barnes and Noble Discover Great New Writers Award. Her latest book is The Ronin’s Mistress. She has also written a historical suspense series that stars Charlotte Bronte, the famous Victorian author. She lives in New York City. Mary Stanton is the author of more than forty novels and the senior editor for three mystery anthologies. She is the author of the popular Beaufort & Company mysteries. She writes two mystery series as Claudia Bishop: The Casebooks Of Dr. McKenzie and The Inn At Hemlock Falls. All are from Berkley Prime Crime. She also has an active career in middle grade fiction: The Magical Mysteries (Berkley) and The Unicorns of Balinor (Scholastic). She is a great admirer of complex, literary political fiction (and wishes she could write it herself). Among the film and literary works she favors are all of Allan Furst’s novels, All The King’s Men, State Of Play, To Play The King, and that steller stunner from Starz, Boss. Elevators access the 6th floor after p. m. All programs are FREE and subject to last- minute change or cancellation. Claudia Bishop (seated at table) celebrates the Sisters in Crime bookstore initiative with her friends in Florida. Photo by Howard Henderson. 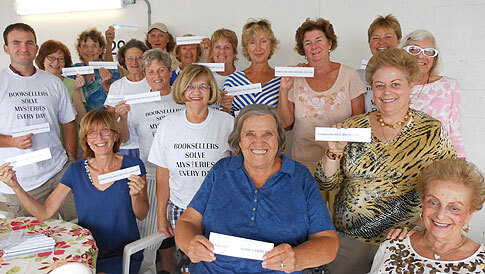 Claudia Bishop (seated at table) celebrates the Sisters in Crime bookstore initiative with her friends in Florida. Photo by Howard Henderson. Read more about next week’s event. Claudia Bishop (aka Mary Stanton), best-selling author of the Hemlock Falls mystery series, and member of Sisters in Crime, an international organization founded to support the professional development of women writing crime fiction will work as a volunteer staffer at Murder on the Beach Mystery Bookstore on Saturday, April 21, from 10 a.m. until 4 p.m. as part of a Booksellers and Librarians Solve Mysteries Every Day celebration. The event, produced by Sisters in Crime, is designed to thank librarians and booksellers for 25 years of support of the mystery genre. Sisters in Crime was established with an organizational meeting held in New York City in the spring of 1987. On April 21, a select group of Sisters in Crime member authors will be volunteering in bookstores and libraries in their hometowns from Albany, New York, to Honolulu, Hawaii, from 10 a.m. to 4 p.m., local time. In addition, SinC’s more than 3,000 members worldwide are gearing up to go into libraries and bookstores on that day to personally thank the booksellers and librarians they find working behind the counters and in the stacks. Bishop (aka Mary Stanton), was born in Winter Park, and now lives in West Palm Beach, published her first novel in 1988. In all, Stanton has written nineteen mystery novels, two adult fantasy novels, eleven novels for middle-grade readers (including the successful series, The Unicorns of Balinor), and three scripts for a television cartoon series. For more information, visit marystanton.com. Murder on the Beach Mystery Bookstore is located at 273 NE 2nd Avenue in the Pineapple Grove section of Delray Beach. The store is open Monday through Saturday from 10 a.m. until 6 p.m. and Sunday from noon until 5 p.m. The store may be reached at 561-279-7790 or murdermb@gate.net. Sisters in Crime is currently celebrating its 25th anniversary year. The organization is made up of more than 3,000 members and 48 chapters worldwide authors, readers, publishers, agents, booksellers, librarians and others who love mysteries. Visit Sisters in Crime online at sistersincrime.org. ]]> http://marystanton.com/blog/145/best-selling-crime-fiction-author-claudia-bishop-is-a-bookseller-for-a-day Fri, 13 Apr 2012 14:33:28 GMT Mary tag:marystanton.com,2012-04-13:a179e5d38d22b48fbd20e6277d233d24/26facb21a72dbac950e7cb8117831c3e Angel Condemned Giveaway! Bookin’ with Bingo is giving away a copy of Angel Condemned. All you need to do is comment on her preview of my latest book. The contest ends January 12 — good luck! ]]> http://marystanton.com/blog/144/angel-condemned-giveaway Wed, 28 Dec 2011 22:51:50 GMT Mary tag:marystanton.com,2011-12-28:a179e5d38d22b48fbd20e6277d233d24/5f70255793c1887f1e9d63cd2a2081fd Read Chapter One of Angel Condemned online for free at Scribd! Angel Condemned, the fifth in my series of Beaufort & Company Mysteries, will be published November 1, 2011 by Berkley Prime Crime. In advance of that event, I’m offering Chapter One freely to anyone who wants it. And, for the first time, I am making this chapter available on Scribd, a great online document-sharing site. Scribd allows you to read documents online, download them, print them, and share them with your friends on social networks like Facebook and Twitter — which I certainly hope you will do in this case! You can also pre-order the book now from Amazon.